This just in: Italians are good at food. Like annoyingly good. Ground-breaking stuff, huh? 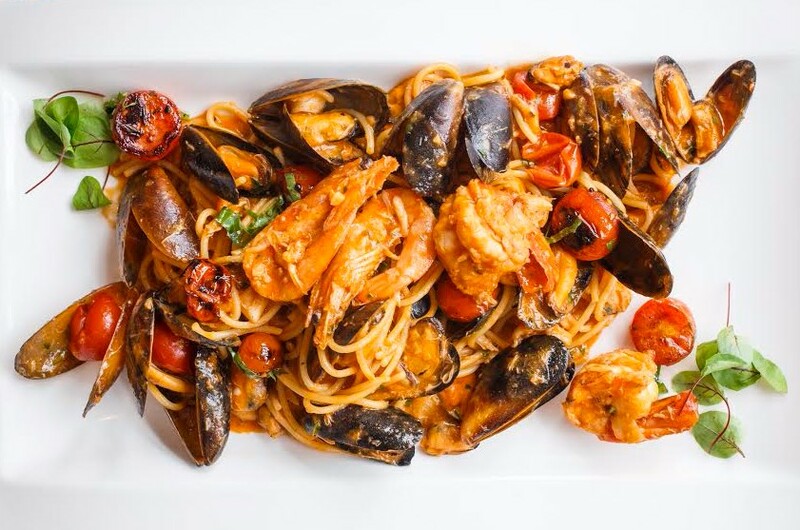 There are plenty of establishments to get your pizza and pasta fix in the city, so we went to Cucina Rustica to find out where it sits in the equation. As committed breadphiles, Focaccia Romana is a strong starting point — the traditional Italian bake was light and airy, and topped with spinach, parmesan, and a refreshing tomatoey onion goodness we are determined to recreate at home. And a Prosecco pairing is always going to please us. Starters are the king of eating out — as a general rule we'd happily dine out on antipasti alone. And the trio of starters answered a lot of our prayers, and were indeed the best plates from our visit. The satisfying crispiness of Fritto Misto (literally fried things of the scallop and calamari variety), and the salty, garlicky goodness of Gamberoni and Funghi con Formaggio di Capra (grilled Portobello mushrooms with goats cheese) are our happiest of foodie places. Have them with a delicate and aromatic glass of Fiano Salento for the full effect.